At YUMEMI, a company which handles the planning and development of applications and services and engages in digital marketing, mainly for mobile environments, AWS is broadly used in system infrastructure. The elements that allowed this company to be able to meet their needs of performing accurate monitoring while making use of the merits of clouds that are flexibly scalable were Zabbix and a template provided by TIS, a Zabbix Certified Partner. 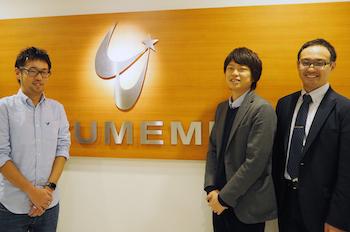 YUMEMI is a company which handles planning, development, and digital marketing, mainly in mobile environments. In recent years, this company has been providing solutions by utilizing Amazon Web Services (AWS), which is capable of flexible operation according to the needs of the user. The solution that was introduced at this company in order to monitor systems having the characteristics unique to clouds was Zabbix. When it comes to the concept of emphasizing flexibility, the natural choice is to utilize cloud services that can be introduced quickly and that can be scaled when necessary. Because of such factors, YUMEMI, as an APN consulting partner of AWS, has been developing and providing solutions by combining cloud services with applications and the like for smartphones. This company, which had originally been proactively utilizing open source software, monitored cloud services with monitoring tools such as Nagios and Munin, and with “Amazon CloudWatch” provided by AWS. However, “For example, monitoring a server that does not have a global IP address required a somewhat tricky configuration, and properly using multiple management screens and configuration files was complicated” (Mr. Kohara). He also said that the fact that communication between the monitoring server and monitoring targets was not encrypted was another item of concern in regards to security. While searching for tools capable of solving such problems, the selection that surfaced was Zabbix. YUMEMI selected Zabbix because it could satisfy all the requirements sought by this company, which wanted to automatically register hosts as the size of the cloud infrastructure increased, in order to perform thorough monitoring, and because, in the latest LTS version of Zabbix 3.0, encrypted communication between the Zabbix server and proxies and agents is possible. Of course, another merit of this selection was that, because Zabbix is open source software, a license fee is not required. Mr. Kazuma Kohara, the System Architecture Department at YUMEMI Inc.
For these reasons, YUMEMI made the easy decision to use Zabbix, but Mr. Kohara had some apprehensions. “For systems at YUMEMI, monitoring is a very important element, so we must perform monitoring properly. I made a halfway attempt to build a monitoring system with Zabbix, but, as expected, I was very worried about whether or not my method was suitable. Also, I was concerned about the cost required for the learning I would need until I would be able to use this new tool well” (Mr. Kohara). YUMEMI contacted TIS via a Web form in August of 2016. The development that followed was quick. A monitoring system was built by confirming the monitoring items based on the survey form prepared by TIS in order to determine the configuration, over a workload of approximately one month. 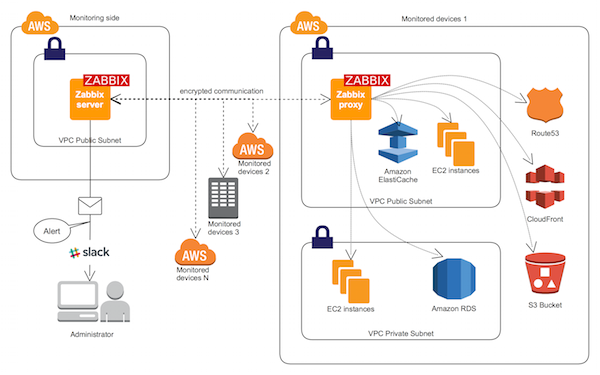 In December of 2016, the development was already at a pace in which monitoring of the Web, processes, and logs, operating with AWS EC2 by utilizing Zabbix was started. Initially, this project started from the monitoring of multiple AWS EC2 instances installed on Amazon Linux, and the monitoring of on-premise systems also started as well. The plan is to use Zabbix Proxy in order to gradually expand monitoring to the entire infrastructure. Mr. Shunsuke Furuya, OSS Promotion Office, IT infrastructure Technology SBU at TIS Inc. The corporate culture of YUMEMI, which proactively tackles new work styles such as telecommuting, is also a factor. After YUMEMI made the decision to introduce Zabbix, the project was advanced by making use of face-to-face preparatory meetings, remote meetings, the business chat tool Slack, the project management tool Backlog, and the like, and this allowed the introduction to move along in an agile way. Mr. Daisuke Ikeda, Section Chief of OSS Promotion Office, IT infrastructure Technology SBU at TIS Inc. In this matter, monitoring with Zabbix was started at YUMEMI. “With the current monitoring tools, it was extremely difficult to perform detailed configuration of each device during scaling. However, a major merit of using Zabbix is the ability to automatically perform monitoring according to auto scaling, which is a characteristic of AWS” said Mr. Kohara. Mr. Kohara went on to say that: “In the past, we needed to make proper use of variety of consoles and switch between the screens of these consoles in order to know the status of resources. With Zabbix, we could gather all of these into one program, which has made our work a lot easier. I also really like the design of the new console in Zabbix 3.0.” Because this software could be introduced without having to install a large amount of dependent packages, it seems like it is helpful in reducing the workload of the user. Once a problem occurs, we get complaints from a variety of sources. However, if there are no problems, we don’t hear anything from users, which means that the infrastructure is operating normally. YUMEMI has said that sharing the monitoring status of Zabbix with project managers who are engaged in the development of different services and applications results in the stable operation of the infrastructure. So far, Mr. Kohara evaluated the introduction effects of Zabbix with “a perfect score of 100 points”. He also said that, in the future, he would like to continue pushing forward automation of infrastructure configuration using Ansible, in order to create a mechanism in which tight monitoring can be easily performed with a single click. YUMEMI, since its founding in 2000, has been engaging in digital marketing support and the creation and development of Web services as a leading company in the field of mobile services, and has been creating a future in which cellular phones are the focus of consumers. Currently, as consumers are switching from conventional cellular phones to smart devices and as the associated external devices are also increasing, YUMEMI believes that we have reached the age in which the personalized B to C communication that this company is aiming for can be achieved. Currently, with its two business domains of “1. Omni-channel integration” and “2. Device linking”, YUMEMI is working with a variety of companies in order to tackle the reality of one-to-one communication. Want to share your story of using Zabbix Monitoring Solution? Fill out this Questionnaire Or contact our Marketing Team for further assistance.